Herbs are usually dried and pre-ground before being packaged and shipped to stores. This diminishes their flavor exponentially, and their pallid aromas barely season anything we cook. Luckily enough, culinary herbs are compact plants that can grow in some odd, but adorable places. Enjoy year-round, fresh, bursting with flavour herbs with this guide to indoor herb garden ideas. My grandmother always had a fine eye for tea sets but never enough people to invite over to use them. Sounds familiar? If you have an old tea set lying around, use them as planters instead. Herbs will grow well in both teacups and teapots, as well as creamers and sugar bowls. Do you know what’s an underused space in your house? Your ceiling. If you don’t have much room in your house, grow an inverted herb garden from your chandelier! Upside-down plastic bottle planters are perfect for this. Just choose your herbs, plant them in the bottles, and hang them up. They’ll be conversation starters at your next dinner party, and your guests can reach up to get more parsley as needed. Does your family go through a lot of jam and jelly? Save those little jars and use them as windowsill planters. Just tuck the jars into a pretty container and keep it on your windowsill. A long time ago, milkmen would deliver milk in glass jugs to people’s homes, usually transported in wooden crates. Think of it as an early form of Uber Eats. With a little bit of yard sale or antique shopping, you can find some of these crates without spending a fortune. You can then line the crates with plastic bags, fill them with soil, and add your favourite herbs for a rustic aesthetic. Try nailing pallets up on your walls in place of paintings or framed prints. Plant herbs inside the pallets’ ridges by creating individual boxes in between the wooden ribs. That way, the herbs can poke out through the front ridges and you can get a living work of art in any room in your house. You know those small organizer drawers you can get at IKEA or hardware stores? They’re basically perfect for countertop herb growing. Just fill the drawers with soil and plants, and then stagger them open. Shoe organizers come in a variety of different materials, and can be hung up on any wall in the house. Just use them to grow plants instead of housing those 40 pairs of flip-flops you bought on impulse. Tiered cake stands can be found for pennies at antique shops and garage sales. Just add some mini planter pots, and you’ll have a stunning garden on your countertop in no time! It’s no surprise that many people who grow indoor gardens live in residential areas without a lot of green space. Using either wood or metal, all you have to do is create a frame strong enough to support your potted herbs. Position this option in a south-facing window for optimum light, especially if you’re planning to grow herbs indoors during the winter. Instead of throwing out an aquarium or fish bowl that you aren’t going to use, fill it with soil and your favourite seeds instead. Your house will be smelling like a freshly planted garden in no time. Coat hooks are always a useful. Sure, they hold coats and bags, but did you know that they can also hold plants? All you need to do is to make your pots hangable, and then hook ’em up. You can do this by adding ribbon, chains, rope or another string-like material around your pot or jar. Then suspend them from your coat hooks for a new Garden of Babylon in your front hall. If you have a bookcase that’s sadly lacking in reading material, give it new purpose as an upright garden. Just position it somewhere it’ll get several hours of daylight, even indirect. Position your pots towards the shelves’ edges, and make sure there’s plenty of space between them. If you’re an avid gardener, you probably have a ton of Mason jars around. After all, you’re canning and preserving your glorious produce so nothing goes to waste, right? Right. Take some empty jars, attach them to boards with metal bindings, add soil, and voila! You now have a wonderful herb garden you can hang on any wall. This aesthetic is perfect for rustic decor, and looks as great in a bedroom as it does in a kitchen. For added appeal, add nasturtiums into the mix. They’ll spill over the jars’ sides and add visual appeal, as well as flavor to your meals. Have you ever watched a horror movie where the mad scientist is in his lab full of oddly shaped jars and tubes while he conjures up a deadly concoction? Have you ever wanted to be that scientist? Well, now you can. If you’re up for the challenge of searching for those intriguing and beautiful glass vials and test tubes then why not go ahead and fill them with herbs? Herbs are, in fact, safer than poisonous chemicals. As an added bonus you’ll even be able to see the roots of your herbs as they grow. Look for test tubes, beakers, and flasks at garage sales and thrift shops. There are two types of tin cans that can be used. You have the antique, old, maybe rusty but gorgeously painted tin cans that held food, motor oil, tobacco or other precious goods. Or you have the can that held your dinner the other night before you cracked it open and microwaved your bowl of soup. Whatever tin can you choose, or have the budget for, the good news is that they both work equally well! All that needs to be done is clean the cans, then poke some holes in the bases for water drainage and finally fill with your favourite herbs and soil. Those bamboo steamers that are used more often for making dumplings are also ideal planters. Line them with plastic so they don’t leak, add soil and herbs, and enjoy! Just make sure to keep an eye on them to make sure they’re not rotting or falling apart. Since these are biodegradable and porous, they’re prone to getting moldy. Check them regularly, and replace them when and if you see mold appear, or if the weaving starts to break apart. Maybe you got a good deal and managed to find herbs already growing in clay flower pots at your neighbourhood florist. These classic clay pots are an absolute joy to work with as they can stand the tests of time and weather, can be easily painted and can come in all different shapes and sizes. Why not use these already existing pots for your herb garden? A clever idea that has recently gained attention is to use macrame to weave a hanging basket and then to place your potted herb in this basket. The best part about this style is that you can hold multiple baskets in your macrame holder. Here’s a tip: these macrame planters were super popular in the 70s, so your parents, aunts, or grandparents may have some old ones in storage. Raid their attics, basements, or garages for them, and go wild. Did you like the idea from point #6 but you don’t happen to have any available pallet lying around? Worry not, as a simpler design also exists. With this method, You just need to grab a pot, jar, carton, box, or any other type of container that has at least one flat edge. After choosing your preferred container, fill it with soil and whatever herb you’d like to grow. Then, hook it up to a wall that you feel could use a bit of brightening up. This is a great way to add texture to an interesting art piece, or you can use it as a decorative element all its own. You know those handy kitchen racks from which you can suspend wooden spoons, ladles, and pot holders on little hooks? They’re also great for herb pots. 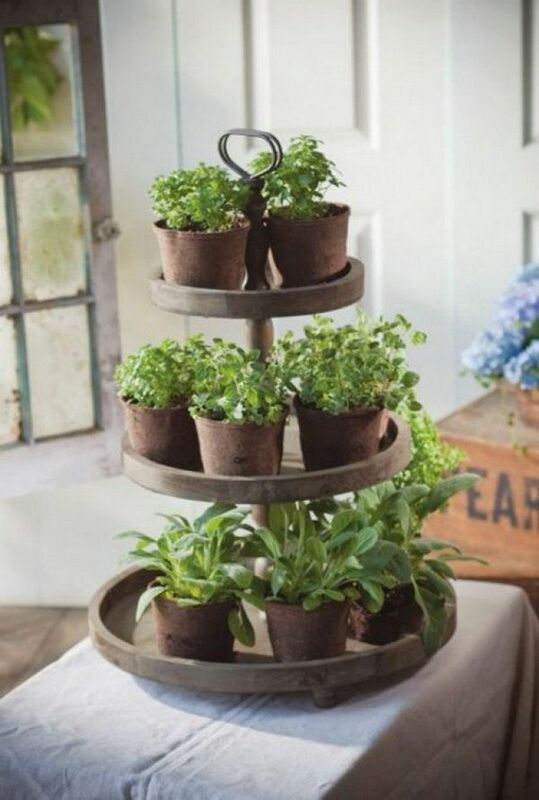 Just fill small utensil containers with potting soil, pop some herbs in, and hang them up. They’ll be in easy reach, right between the spatulas and spaghetti tongs. With these indoor herb garden ideas, you can always grow your own basil or thyme within easy reach. You won’t have to trudge through snow and rain to get some fresh chives either: just pinch off what you need from your windowsill or similar. Just make sure to do your research so you know what your chosen herbs’ soil, water, and light requirements are like, and you’re golden.